As a valued client of Smith Newmans, we would like to show our appreciation for recommending our services. We are very pleased to launch our Client Referral Scheme, which offers a choice of “thank you” gifts. 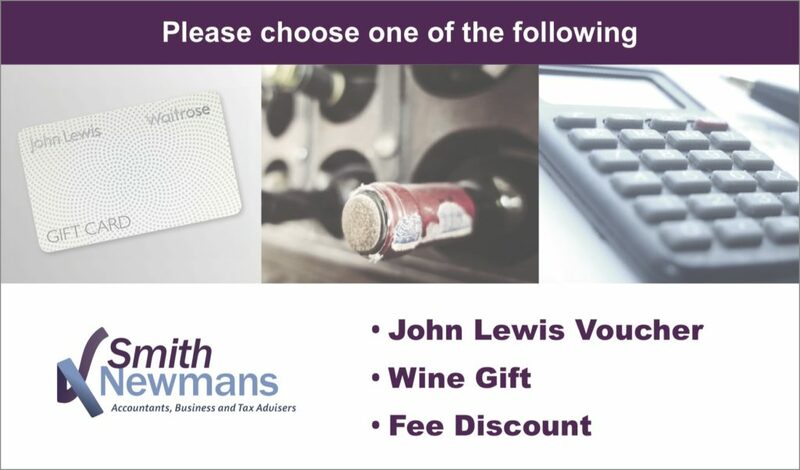 Refer Smith Newmans to clients, friends and family and as soon as they become clients of ours then you will receive the reward of your choice from the list below (subject to T&Cs). Simply speak to one of our team or email us the details of your client, friend or family member to admin@smith-newmans.com with the email subject ‘Client Referral Scheme’. When your client, friend or family member signs up to one of our services, you can choose from our list of rewards. The referrer must be an existing fee-paying client of Smith Newmans. The referred colleague, friend or family member must not be a previous client of Smith Newmans. A successful referral is defined as a new fee-paying client of Smith Newmans. The referrer is entitled to select one reward for each successful referral. Your reward will be on its way to you as soon as we receive settlement of your referral’s first year fees or an annual payment plan is put into place. Reward size will be relative to the annual fee introduced.